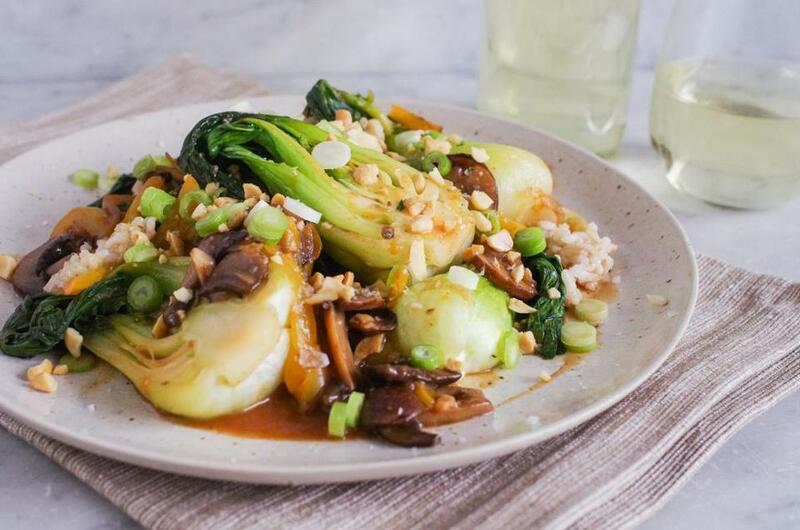 Gochujang (pronounced go-choo-jahng) flavors this stir-fry of baby bok choy and crimini mushrooms. The fermented Korean chile paste is made from red chiles, glutinous rice, and fermented soybean and is rich, subtly sweet, and hot. Begin with a teaspoon, then add more later, if you like heat. Little heads of baby bok choy range from about 4 to- 8 inches; you may need to halve the large ones. Spoon the vegetables and sauce over brown rice and sprinkle with scallions and peanuts. You need a wok or very large deep skillet to hold all the vegetables. 1. In a small bowl, stir together the stock and gochujang. 2. Slice off a tiny piece from the stem ends of the bok choy but keep the heads together. If they are large, halve them lengthwise through the stem. 3. In a wok or very large skillet over medium heat, heat the oil. Add the onion, bell pepper, and a sprinkle of salt. Cook, stirring occasionally, for 8 minutes, or until the onion is starting to brown. 4. Add the mushrooms, turn the heat to medium-high, and cook, stirring often, for 4 minutes, or until they soften. Stir in the garlic and cook for 30 seconds. 5. Move the mushroom mixture to the sides of the pan. Add the bok choy to the middle and cook, using tongs to toss them, for 3 minutes, or until slightly wilted. Toss the bok choy with the mushroom mixture and cook, stirring often, for 3 minutes more. 6. Add the gochujang mixture and cook, stirring often, for 3 minutes more, or until the bok choy is tender but still bright green. 7. In a small bowl, whisk together the water and cornstarch. Stir them into the sauce and cook, stirring, until the liquid returns to a boil and the sauce thickens. Taste for seasoning and add more salt or gochujang, if you like.